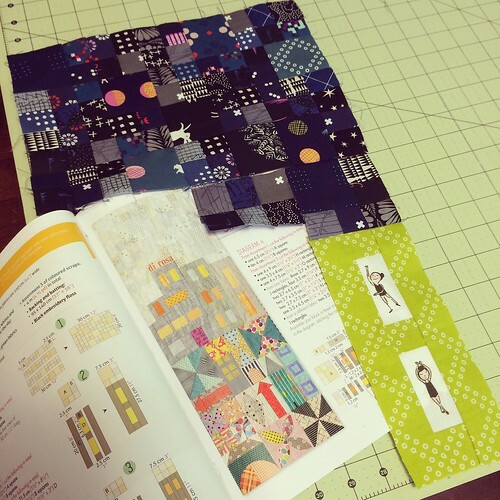 I was looking recently for a project to kind of move me out of a sewing slump and so I decided to drink the kool aid over on IG and participate in a QAL going on there. People are coming in droves to make an epic quilt (as they all are) of Jen Kingwell’s. 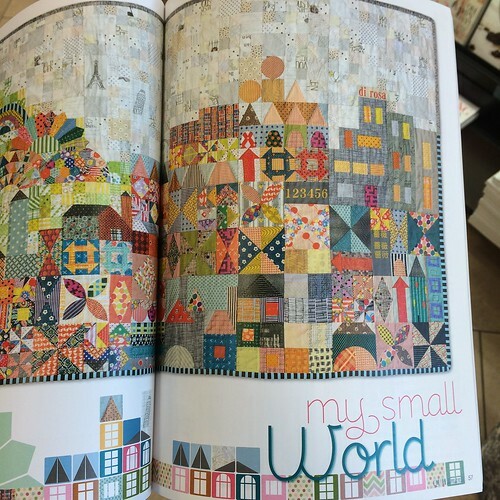 It is in the special recent issue of Quiltmania and is call My Small World. But me being me, I couldn’t just make it the way it is pictured in the magazine. As much as I love low volume fabrics, seeing them used for the “sky” just reminded of gloomy overcast days. And we have too many of those for me to spend time making a quilt with one. So I decided to approach it from a different time of day and knew that a NIGHT sky would be perfect for me. I made it just as scrappy as I could (I have a LOT of blue fabrics!) and I am thrilled with how it turned out. 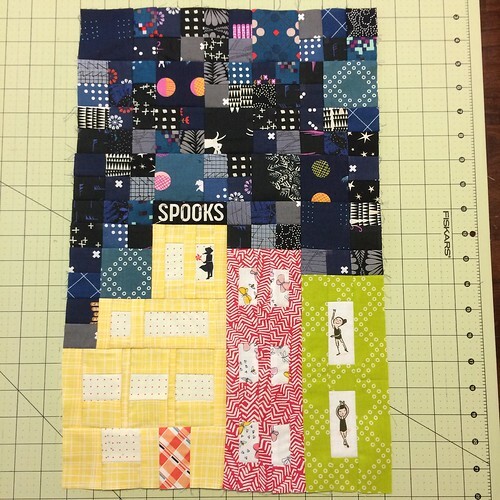 Then I set off on making the first set of buildings…at this point I am *maybe* half way through section 1 of 7 I think of this quilt. And I have already spent a VERY long time on this. If you are familiar with these fabrics then you might be able to tell the scale. If not, I should have put a penny on there. Those little night sky pieces? They finish to 1″ square. Uhm, yeah…. that’s small. And as you can see I was doing enough fussy cutting to add some extra challenge to it all. I have to let this project go. I’m admitting that this is not the project that I need right now. It kind of kills me because I love it…but it was NOT relaxing me the way I wanted a project to. And it was taking MUCH more time than I planned on giving a side project. Thankfully I was able to pass it all on to someone who is planning on finishing up what I started and was having a hard time finding the magazine. So my work will hopefully not all be in vain. 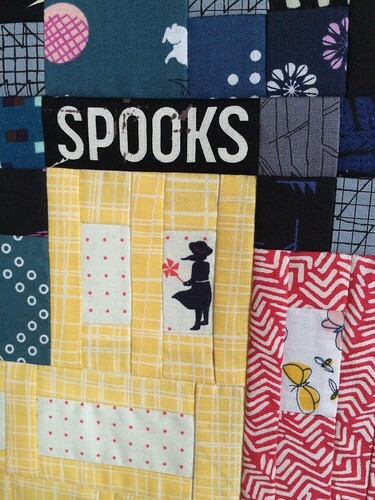 The quilts people are making are beautiful. (check them out under the # mysmallworldqal) I think I actually have too much fabric right now to make a quilt this small with this many different fabrics. I don’t know if that will make sense to anyone else but me. Love the night sky idea. thank you so much! I really adored that idea too! It is beautiful, but I will take good counsel from your decision and avoid "drinking the Kool-Aid" myself! I've been tempted, but don't really need any more projects, no matter how beautiful. And it could turn out to be another "Swoon quilt" for me – something I really didn't enjoy making, but had to finish once started! Sorry, but I find the phrase "drink the Kool-Aid" offensive. Over 900 people followed a maniac to their deaths. Parents poisoned their children. In my opinion it should not be used as a euphemism for jumping on the bandwagon. I'm so sorry that you found that phrase offensive. I certainly never intended to do that. I had no idea where the phrase originated and had to research it after your comment. I found that the event in question occurred before I was born and I (thankfully) had no knowledge of the tragedy. I think you will find that people use the phrase in innocence as it has become a colloquial expression to mean "joining in". But again, I apologize that you were affected by my use of it. This year I passed on five different projects I came to realise I would never finish and in one case a block of the month I never began. When I finally let go it was such a blessed relief. I rather imagine you felt the same, well done you and I'm confident the right project is nearby waiting for you. It can be tricky to give up the idea of making a project that looks so intriguing. But ultimately we are all just a bit more grown up for realizing our limits. Hi five for making good decisions! I found your 'drink the kook-aid' to be pretty hilarious. But I also think you are making a good decision here. It will save you hours of agonising in the future. So very true!! Whenever I find myself snowed under and not enjoying the process anymore, it's because I wasn't deliberate and didn't say no. so Good For You!! Wow! If those are 1" squares, you got farther along than I would have! I was so tempted on this one, too, but I. 'm glad I skiped it, too! I hadn't noticed it was a night sky. Very nice. I can understand not being able to finish. It's nice you're able to pass it on. Good decision! I started to "drink the kool-aid" on this as well. I spent a week of searching for the magazine/pattern with no luck. I got behind before I got started. I figured this was a sign for me to let it go. So I did! Don't worry about it. Now that I am not creating for shops and have retired, I just sew what I like, when I like, and sure takes these pressure off and allows more breathing space for creativity. I totally understand. Sew what you love girl! I loved the night sky idea, and I love even more your choice to give this up because it wasn't the right thing for you now. There are so many areas of life where we have to persevere through hard things, but sewing time ought to be for fun. Good for you! Since my magazine has still not arrived I'm losing interest in making this one too. I'm proud of you for recognizing this and Letting it go! I’ve learned that I have certain types of projects that I love to make and others that I avoid. Deliberate is a great word. I use it daily.